Welcome back to another great challenge! Closing date for entries: Fri 22nd December, Noon. Max 2 entries per person, no backlinks. The winners of Week48 are at the end of this post. We have so many lovely goodies in store right now including beautiful decorations and embellies to add finishing touches to your Xmas Cards and decorations - don't miss it. 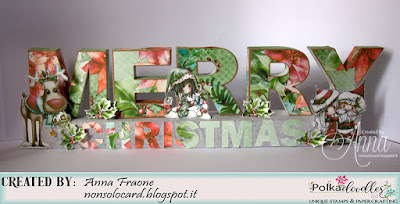 It´s me, Tina - I have created a small set for the New Year's Eve party. It includes a party hat, a cracker, some photo accessories and straws. 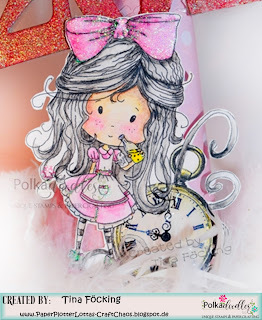 I used Winnie with the clock out from the big bundle Winnie Wonderland and colored her with Polychromos. 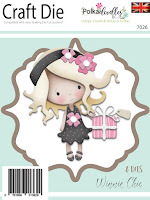 The digital paper comes from Winnie Sugar Sprinkles - Heaven 7. Angie J - I have used Something to Say - January. This time I have made a Gift Tag to pop around the neck of a wine bottle. Coloured with copic markers. The stamped sign says "Happy Alcoholidays". A very simple and quick one layer Gift Tag! 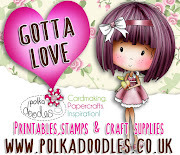 Ania - I used the Marigold digi stamp from the Darling Buds collection. The image I colored with alcohol markers and fussy-cut the image that I placed on the cosmos/night sky background (done with alcohol inks on yupo paper). Anjie - I used the Frosted Winter collection to make this. I printed the papers onto card so I could distress the edges and mount them onto 3D foam. The purple card at the back is a shimmery purple which is perfect for this collection, although it doesn't show up in photos. I them fussy cut all the letters and numbers and mounted them on 3D foam as well. I then added a flower and some gems to finish it off. Stephanie here! It's the time of year for celebrations and it's always Tea Time in Wonderland! 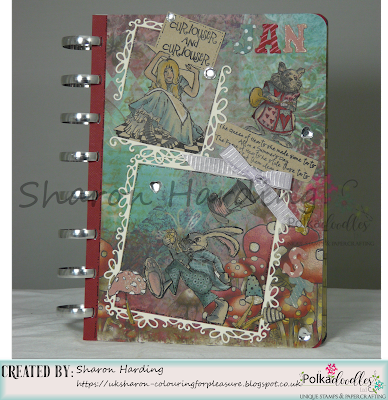 Winnie in Wonderland is the bundle used for this collaged mixed media canvas. 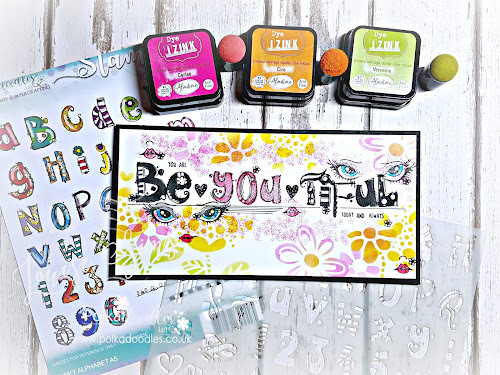 I painted digistamp and collaged a few pieces from the design sheets. All the details can be found on my blog. 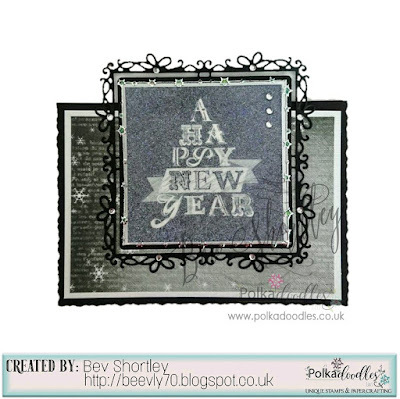 Bev here, I fancied trying to make an elegant, classy, black & white New Year card this week. Less is more I think here, I used a topper from Octavia Frosted Winter and glittered it then adhered it to a pearlised white mat & added that to the very ornate Ribbon/Gift Frame. I then turned a black A6 on it's side (landscape) mat and layered some backing paper from the same collection and then added the topper. To finish it off I also added a few gem stones. A really CAS design. Merlina here with a card featuring Winnie-white-christmas-big-kahuna, she is so cute, isn't she? Claims must be received by 26/12/17, please refer to Challenge rules at top of blog. Please email us HERE, quoting the following code PD0wk480123 to claim your download voucher from the digi store. Merry Christmas! 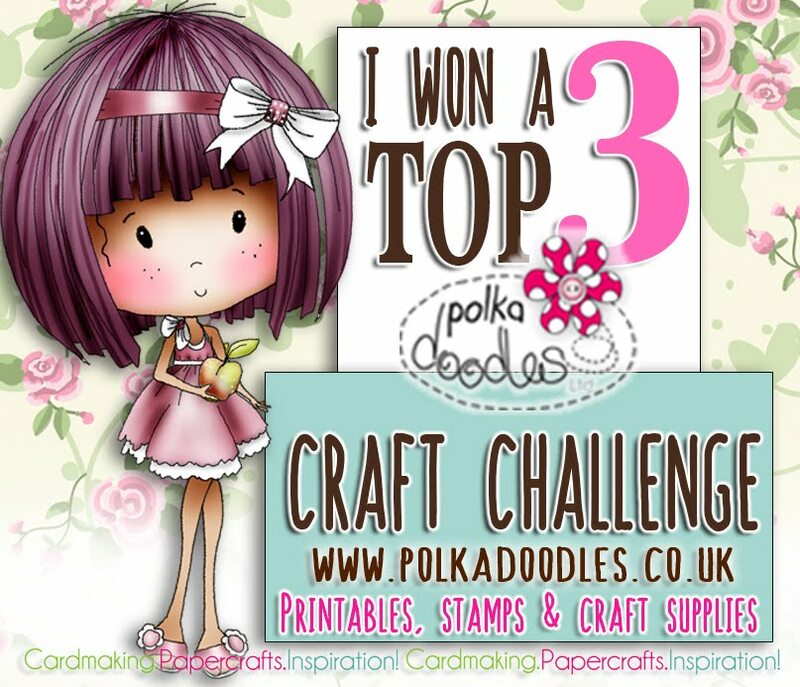 We'll be back on 5th January with a brand new challenge, but make sure you head over to the DIGI CHOOSDAY CHALLENGE HERE where you can also join in the challenges over there and they're back on 2nd January! 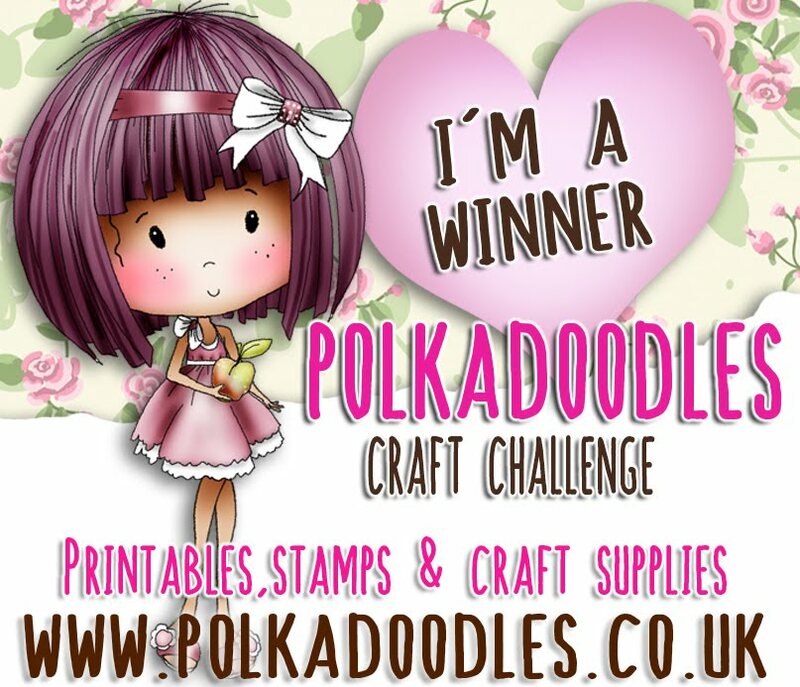 Closing date for entries: Fri 15th December, Noon. Max 2 entries per person, no backlinks. The winners of Week47 are at the end of this post. 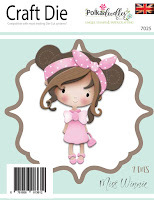 If you're a big Winnie fan - check out our new Winnie GIFT WRAP! It's awesome and selling out fast so don't miss it! 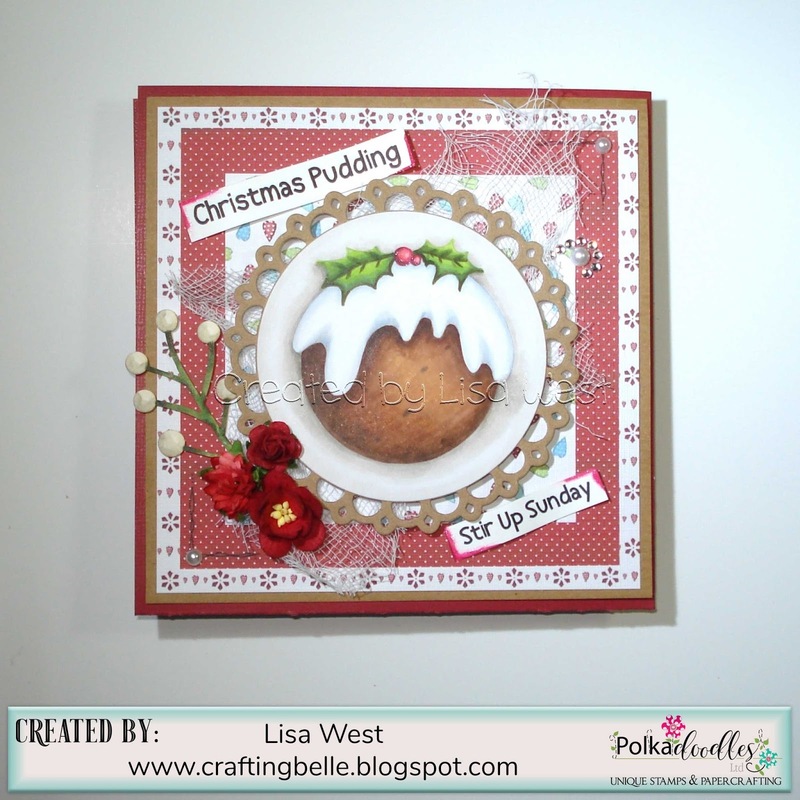 DIGI CHOOSDAY CHALLENGE HERE and enter our Anything Goes Challenge there, too! More great prizes to be won! 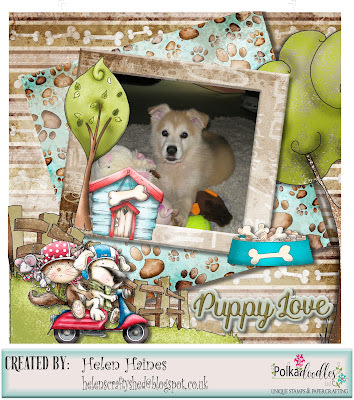 Helen - This week the DT are making projects that are not a card. So I decided to also go not Christmas to and make a scrapbook page. As we have a super cute new German Shepherd Puppy, Max and two kitties Maisie and Oscar who we call Oscie Boo!! 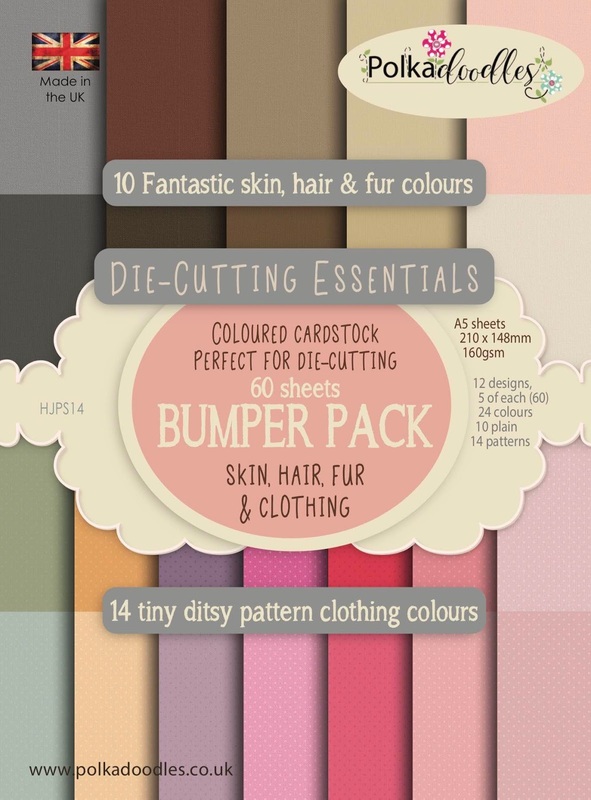 what better than to team them up with the fabulous Horace and Boo collection? You can find here at the store. Anjie - Ssssh I'm gate crashing the other team as I really wanted to join them for a week. I wonder if they'll notice. 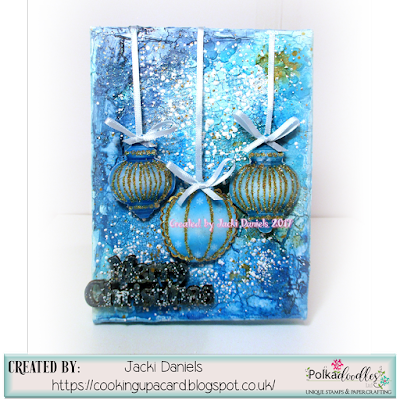 I made a box for this challenge using the Frosted Winter collection. 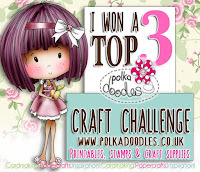 Loads of photos on my blog for this, and also another extra make! So here is the box. Judy - For my project this week I decided to make an altered clock. 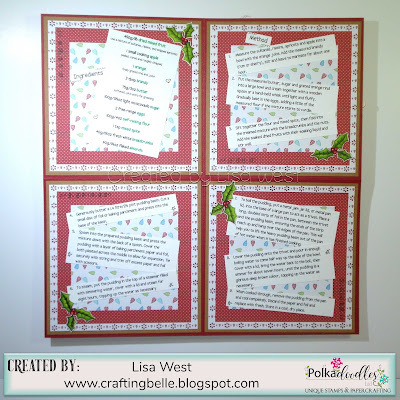 I have used several beautiful Christmas images and designer paper from the Work & Play 5 - Festive Hollybobs. 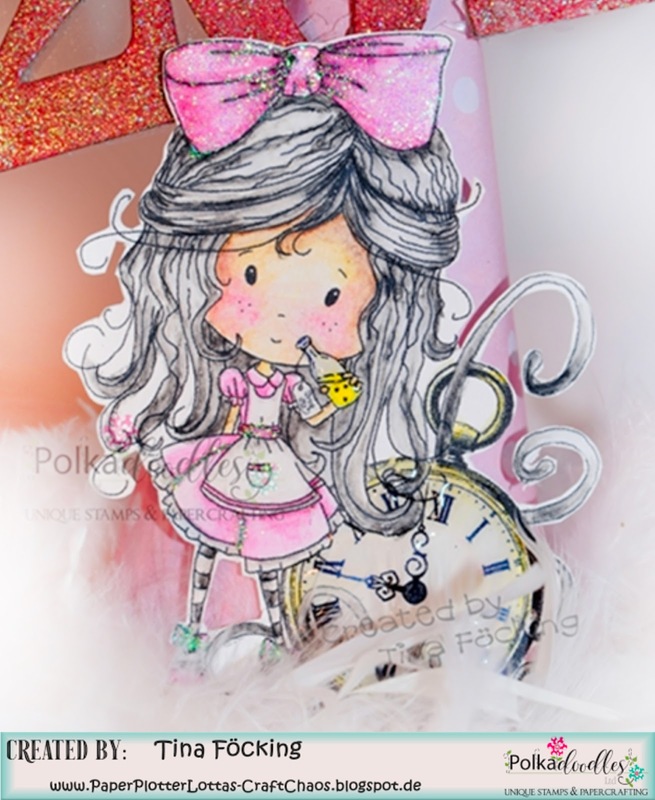 The images are coloured with Copics, gell pen, Wink of Stella and glitter. 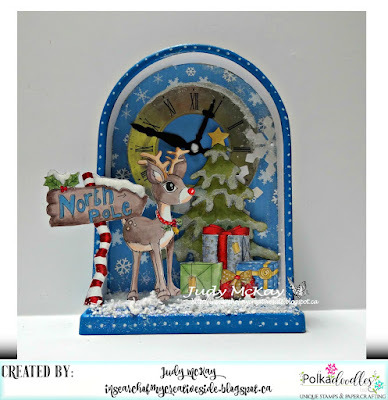 The clock was painted with acrylic paint, Posca Pens and the snow was created by grading Styofoam and adding glitter. 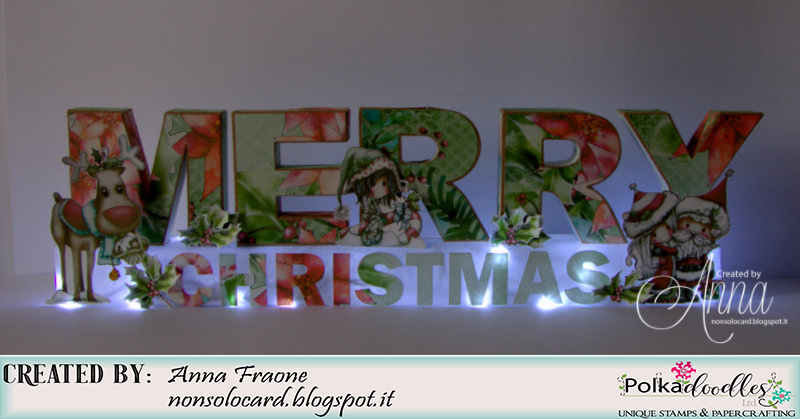 Anna - Christmas is approaching and I thought to use the beautiful collection Winnie Winterland to make home decor. I made 3D letters with my Silhouette and then I covered them with one of the kit's cards ... there's the embarrassment of choice! 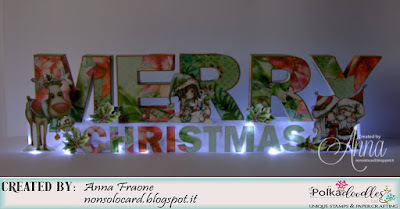 I covered a plastic box with white rice paper, I put the lights and decorated with pre-painted images and the holly branches. Now it's in the beautiful view of my fireplace! 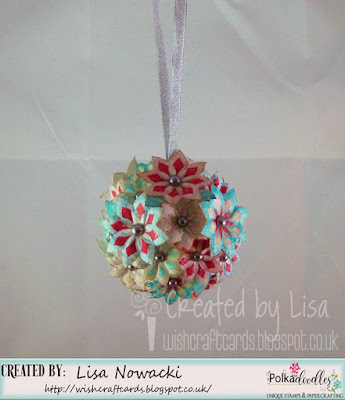 Lisa - I've used lots of flowers and leaves from Winnie White Christmas (plus a polystyrene ball) to make a sparkly Christmas bauble. 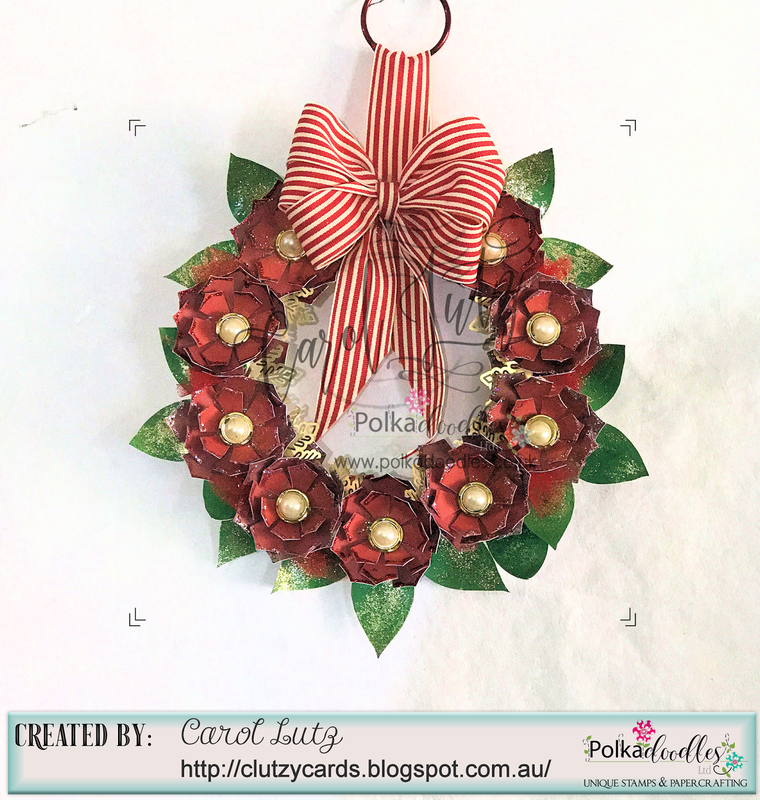 Carol - This week I decided to make a new Christmas wreath using flowers from Twiggy and Toots Festive Fun collection adorned with lots of glitter, sparkly bits and a fabulous bow. 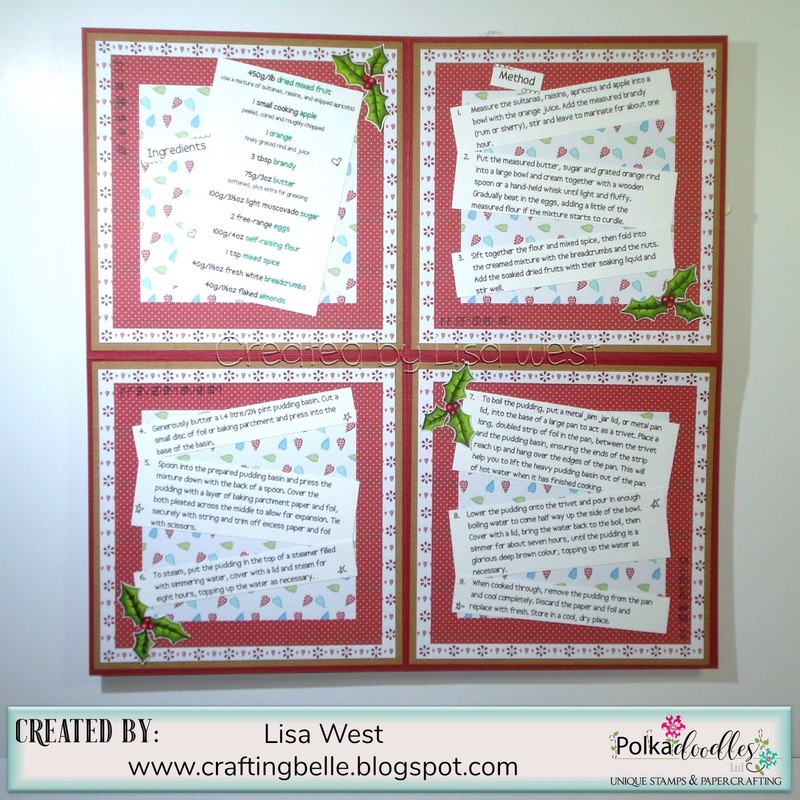 Lisa - I have made a fold out recipe page for a Christmas Album using papers and embellishments from Work & Play 5 Festive Hollybobs Full Download Collection. Vannessa - I am really bad at wrapping Christmas presents (My recipients normally need a hacksaw to get through all the layers of tape on them! ), so I thought I would decorate a gift bag, so all I need to do is add some tissue paper and pop the present inside. Nice and easy then! 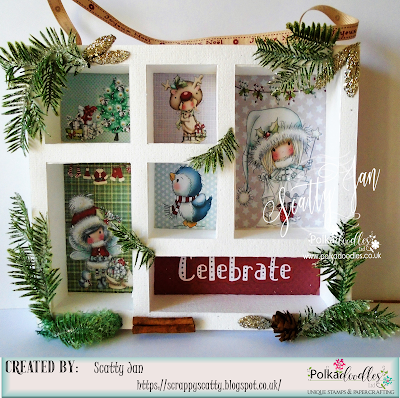 I used another of these gorgeous images from the Octavia Frosted Winter Collection; this time I used Frosted Spines. How cute is this hedgehog?! 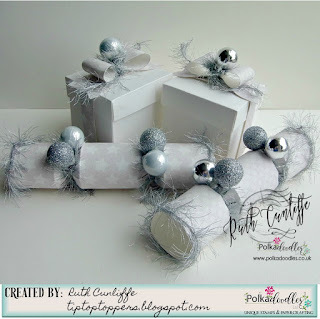 Ruth: I've made two cute crackers and gift boxes using papers from Winnie White Christmas and added sparkly thin tinsel plus some really cute tree baubles I bought from a very well known bargain retailer. I made the bows with offcuts of card (so not to waste anything) and put some treats inside the boxes and crackers. Claims must be received by 19/12/17, please refer to Challenge rules at top of blog. 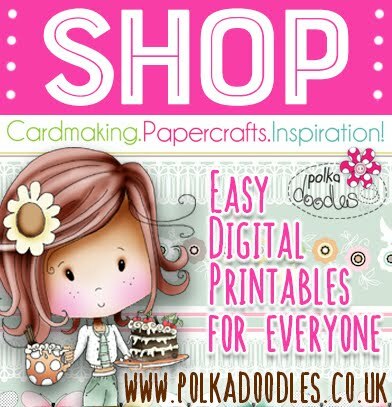 Please email us HERE, quoting the following code PD0wk470123 to claim your download voucher from the digi store. Closing date for entries: Fri 8th December, Noon. Max 2 entries per person, no backlinks. The winners of Week46 are at the end of this post. Stephanie - This week I made a few projects. First are gift card holders created with the Winnie in Winterland Bundle and Winnie White Christmas...they are super sparkly! 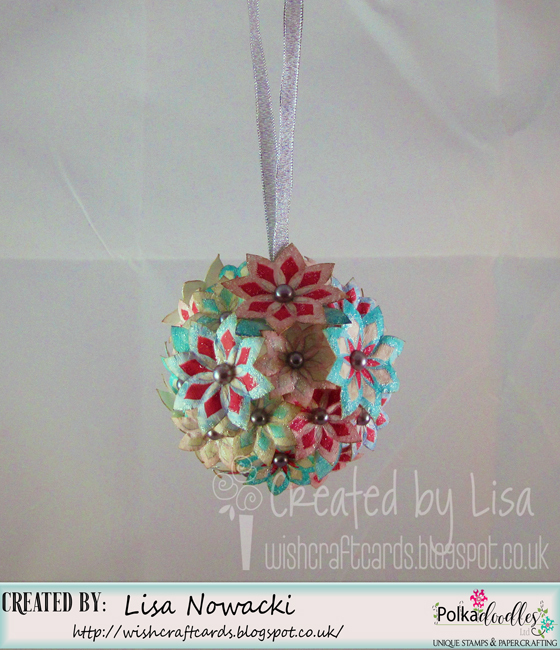 Second project is a corrugated steel ornament with extra glitter and Winnie in Winterland bundle. 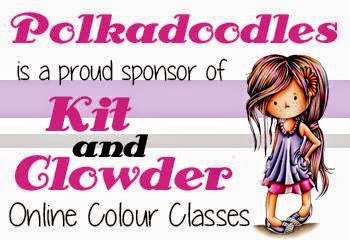 Just click on my name to visit my blog for all the details. Tina: Once again I felt like designing a bigger project. And so I thought to myself why not a kind of LUDO GAME. For the whole decoration and design of the playing area I used Winnie Winterland - Big Kahuna Bundle. Only the playfigures are small mushrooms made of wood. I bought them in a decoration shop. On my blog you will find many more detail photos and descriptions. 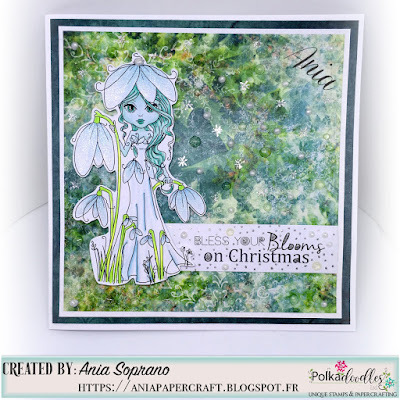 Ania: This time I created a card using the Snowdrop digi stamp from The Darling Buds that I colored with alcohol markers and set on papers from The Festive Christmas collection. The sentiment is from the same The Darling Buds collection, though I added "on Christmas" below to fit well the mood of the card. 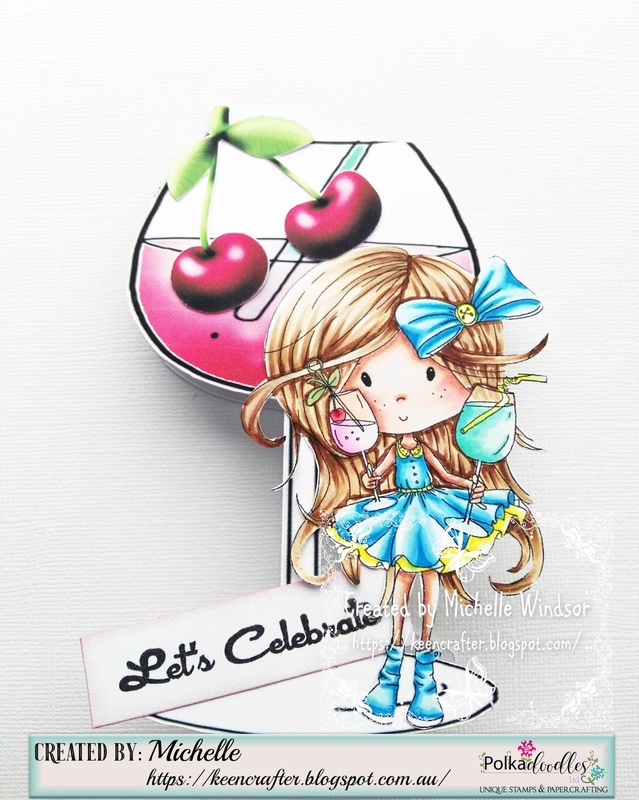 Both the image and the background I sparkled with silver gel pen and glitter pen and finished with perfect pearls and glossy accents. Angie J - I have used Heart on Your Sleeve - January. I coloured with copic markers and added her to my December Planner Monthly layout. 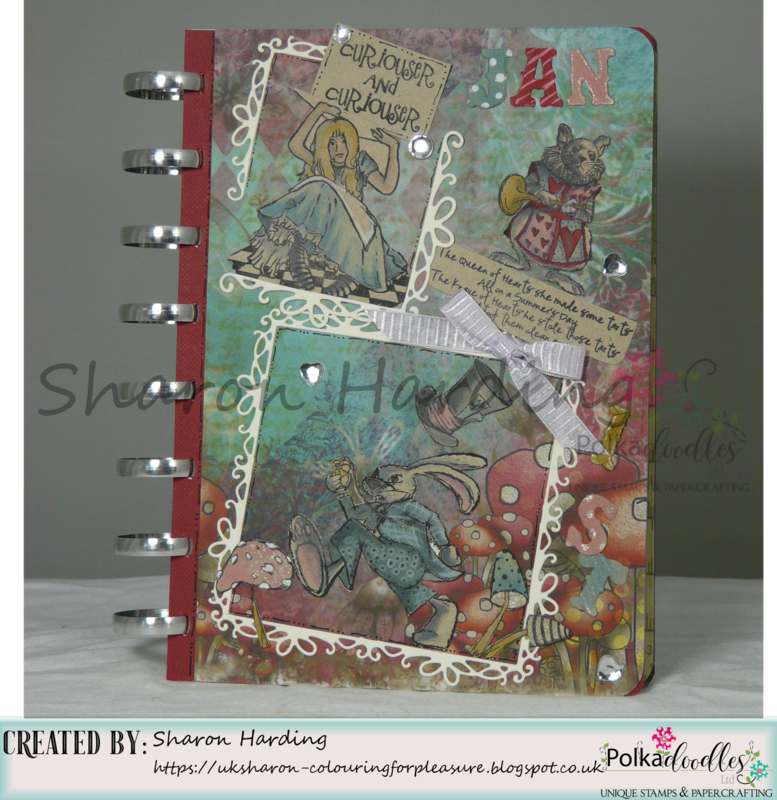 I have used two green washi tapes to give lots of sparkle to my pages. 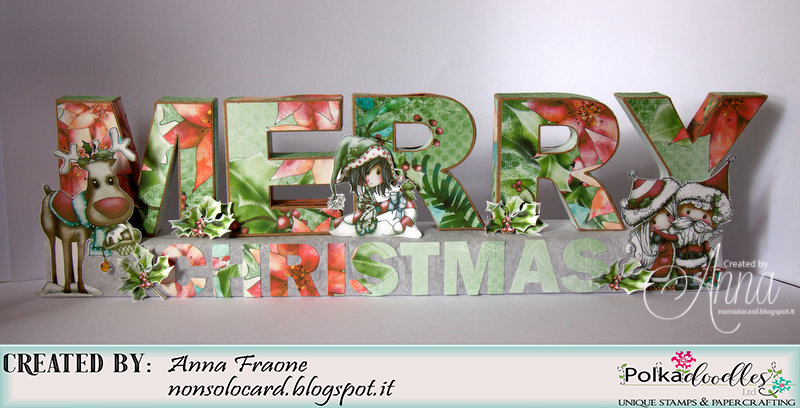 Anjie - I used the Winnie White Christmas USB collection to make this card, along with lots and lots of green glitter card and loose glitter. Everything is mounted on to 3D foam as well to make it pop more. I've added glitter to the snowman, the Believe, Snow, Sparkle and the Noel word art. I've also added it to the number 25 embellies. I've then added 3 sparkly green gems to finish it off as I thought that corner was bare. Loads of close up photos on my blog. 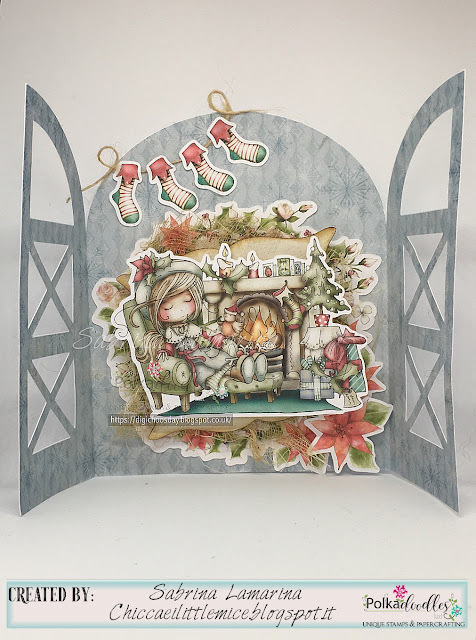 Sharon - For this weeks challenge I've used the Christmas Frosty the Snowman - Clear Stamp Set and two of the gorgeous backing papers from Winnie White Christmas BIG KAHUNA DOWNLOAD KIT - digital printables (the Baubles and Green plait papers). The woodland background was created with my Copic markers. I've added Stickles and gems for SPARKLE! Claims must be received by 7/12/17, please refer to Challenge rules at top of blog. Congratulations to everyone. We thank you all for taking part in our challenges. We love coming to visit and seeing all your wonderful creations.